WordPress' admin interface has been redesigned from the ground up to be as intuitive as possible. 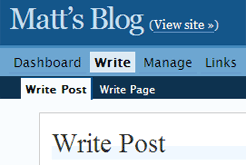 If you've already discovered the joy of WordPress, welcome back. We've got a few things to help you take your experience to the next level. If you feel like you've gotten a lot out of WordPress, consider volunteering your talents for the project. There is something for almost anyone to help out with if you're motivated. Interact with other WP developers. Share your knowledge for that warm fuzzy feeling.